Is your school district interested in starting a local TeamMates chapter? Read through the pages below to determine if TeamMates is the right fit for your community and what you will need to do to bring TeamMates to the youth in your schools. TeamMates is currently partnering with schools in Nebraska, western Iowa, northern Kansas, and eastern Wyoming. What is a Chapter? – Learn about TeamMates mentoring philosophy, organizational structure, and the function of a local TeamMates chapter. 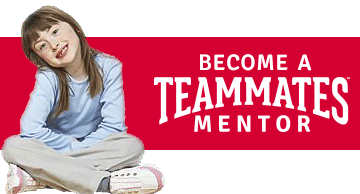 Requirements for a Chapter – Each TeamMates chapter is set up based on a proven model for school-based youth mentoring. Find out what schools and the community need to do to establish mentoring relationships that produce the best outcomes for your students. Steps for Starting a Chapter – Review the process for starting a TeamMates chapter and use the contact information provided in this section to take the first step towards bringing TeamMates to your community. Begin the Request for Program (RFP) Process – Strong TeamMates chapters begin with great RFPs! See what you’ll need to do to get your chapter off to a terrific start.